The helmet brand has eight new designs set to launch at the NEC show, under an initially baffling brand concept of ‘Stealth Hi Vis’. It’s not as daft as it sounds and has developed from the success of HardNutz’s Gloss and Black Hi Vis helmets, that have 19 panels of black 3M material on them. The brand has moved the concept on to include coloured 3M material on the same coloured sections of the helmet. As with black helmets the 3M reflective panels are virtually undetectable in daylight but highly reflective under headlights. Moore Large will have a sizeable presence at the show, bringing the likes of Knog, Lake, 4ZA, SR Suntour along with new wheel brand American Classic. The collection from recently acquired American Classic will see new technology is applied to the range, including 30mm deep Argent Road Tubeless wheels, wide Carbon 38 Clinchers, wide Carbon 44 Tubulars, improved wide Carbon 58 Clinchers and aluminium tubulars with either disc brakes or rim brakes, three 650B tubeless wheel-sets in the race, all MTB and terrain platforms, a brand new line of rims for in 26-inch, 650B and 29-inch, a Lefty Front Disc Hub and 9mm Front Thru Axle Hub, a 46mm long Tubeless Valve Stem and more Thru Axle Conversion Kits. TCX Tubeless wheels with either disc or rim brakes are AC’s first venture into trekking. New to Knog is the latest generation of high-powered bike lights. Delivering a colossal 200 lumen or 300 lumen beam of light (visible to others at over 1,000m) on the front and 70 lumen strobe on the rear, the Knog Blinder Roads give riders 100 per cent visibility at night. The newest and longest lock of the Knog lock range, Party Coil, provides epic long-reaching strength, all coiled into a bright, compact pocket lock. Lake’s 2014 range will be exhibited in the UK for the first time at the Cycle Show. As well as the “world’s first cyclo-cross specific shoe”, Lake have new nylon, carbon and mouldable carbon soled shoes in the road category, fresh MTB models and unique winter models. Moore Large will be taking SR Suntour forks to the show for the first time, but not only will they be exhibiting the forks, they also have them set up on demo bikes, so they can be tested out on the MTB demo track. Also debuting at the Cycle Show is Vangard, which will be showing the team kit offering. ML does the design in-house and the garments are then produced in Vangard’s Danish factory. 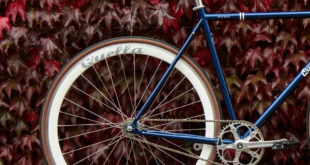 4ZA will be exhibiting its extensive range of components and hand-built wheelsets. Essentially, 4ZA offers three component ranges: Stratos, Cirrus and Cirrus Pro to meet various budgets. Exhibiting on the trade day only, Evopos is offering a 50 per cent discount to the trade. By submitting an enquiry at the stand, dealers can qualify for a 50 per cent discount on three months subscription of any combination of Evopos modules. Evopos is currently enjoying a wave of interest due not least to its release of a free licence for its downloadable Dealer Management System (DMS). The free licence enables dealers to create simple invoices, save customer contact information and produce daily sales reports, giving users a real feel for how the system works. If dealers ever need more functionality, for a small monthly fee you can activate any of the additional modules. These include a workshop organiser, stock control, accounts and management, cycle sale tracking, customer accounts, email and SMS communications, cycle hire management and much more. Continental has lots up its rubberised sleeve in what it calls an important year for the MTB sector particularly. The brand now has a broad range of product for all wheel dimensions, from three different price and quality levels. The highest quality premium tyres are manufactured in Korbach, Germany (including the BlackChili and Protection models), while the new performance products come from the newly built factory in Hefei, China. Finally, the price and performance champions for daily use come from the facility in India. Continental’s Grand Prix 4000 S II has had a facelift, with a discreet bead strip providing chance to colour coordinate the tyre to match bikes perfectly. The size range has been expanded with the addition of a 28 mm option, perfect for the fan of wider tyre & rim performance. This 28mm provides improved grip in poor riding conditions, increased puncture protection and greater comfort. Conti’s new Grand Sport family is based on a solid 60 TPI casing, a NyTech breaker and the durable and super grippy PureGrip tread compound, with each tyre designed for a particular use – the GrandSport Extra offers pure puncture protection, for example. Elsewhere in the range, the award-winning Rubber Queen trail and freeride tyre gets a new name for 2014, to fall in line with the global identity of this tyre – Trail King. The tread pattern and other technologies do not change, but there are some new options. Continental’s 29-inch range has also expanded to now include the more specialist tread patterns Speed King 2.2 and Mud King 1.8, whilst the all-rounder patterns Trail King, Mountain King, X-King & Race King all now feature the added 27.5-inch options. The urban and touring lines have been expanded too. Find out more over at the stand. Taking up an extra stand for its electric line-up, Raleigh’s Cycle Show presence will recap on some highlights from its dealer shows in the summer, including a selection of Haibike’s flagship models. The Bosch-powered Xduro electric line will feature heavily, with the new AMT all mountain rig taking centre stage. At £3,500, this 5.5 inch travel rig sits above various other Xduro builds, such as the entry SL 29er at £2,500, as well as £2,850 RC 29 and FS SL builds. Dare 2b’s spring/summer 2014 range will be the star of stand G48, with products designed for the growing commuter sector, designed to get the rider through the daily nine to five. Key features include 360 degree reflective detailing, air ventilation outlets, d-lock storage waistband, reinforced seat area and displaced shoulder seams for rucksack comfort, all combined with fashion forward, stylish designs. Previous Ready for the cycle industry’s big night of the year?